The Anova Precision Cooker makes it easy to achieve professional-level cooking results at home. To use, simply attach the cooker to any water-filled pot, put your food in a sealable bag, and set the time and temperature. The Precision Cooker heats and circulates the water to a precise temperature, cooking food to an exact temperature which creates maximum tenderness and moisture retention (without worry of overcooking). 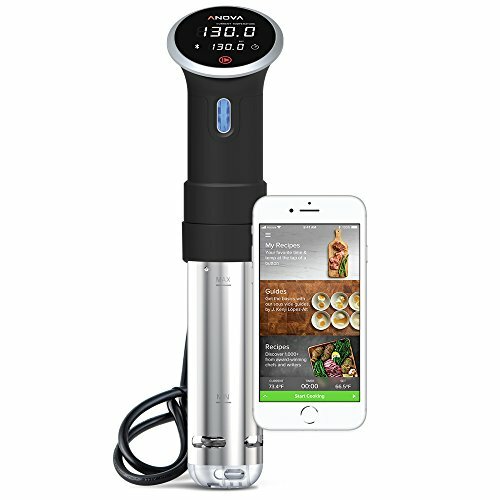 The Anova Precision Cooker connects to your phone, so you can cook amazing meals by the touch of a button - spend less time tied to the kitchen by relying on the app to notify you when your food is ready to Eat. ANOVA PRECISION COOKER BLUETOOTH - Perfect to cook within Bluetooth range from the Anova App or from the device manually. Serves up to 8 people. Fits on any pot. Adjustable clamp. COOK LIKE A PRO - The Anova Precision Cooker allows anyone to cook a restaurant quality meal at home. Our Sous Vide circulator is the perfect kitchen appliance for hands-off cooking of vegetables, meat and much more with consistent control and precision. We're so confident in our product Anova backs it with a 1-Year Warranty. PERFECT RESULTS, EVERY TIME - Precision cooking enables you to produce results that are impossible to achieve through any other cooking method. No dry edges and no rare centers. Juices and flavors don't escape. Food comes out perfectly moist and tender. Continuous temperature control provides reliable and consistent results every time. Perfect for vegetables, meat, fruit, cheese and much more. SMART DEVICE CONTROL & COOKING NOTIFICATIONS - Our temperature cooker is can be controlled remotely with smart devices, allowing you to escape from the kitchen while you cook. Simply download the Anova App to easily monitor, adjust or control the device from your iPhone and Android or other smart devices. The Precision Cooker also provides cooking notifications while you're out of the kitchen so you'll know when your food is ready. The Precision Cooker's bluetooth connection allows you to control the device up to 30 feet away. EASY TO USE - Simply attach the Precision Cooker to any pot, add water, drop in desired food in a sealed bag or glass jar. Start cooking with the touch of a button on the device. The Sous Vide Cooker's timer and precise temperature control allow you to step away and relax while your food cooks perfectly. No additional equipment needed. GET CREATIVE WITH 1,000+ RECIPES - Choose from sous vide guides and recipes created for home cooks of every skill level by award-winning chefs, with simple directions to walk through each recipe with ease. All available free of charge. Great for beginner and veteran chefs! SIMPLE TO CLEAN - The Precision Cooker's detachable stainless steel skirt and disks are dishwasher safe making this kitchen appliance easy to clean and maintain. If you have any questions about this product by Anova Culinary, contact us by completing and submitting the form below. If you are looking for a specif part number, please include it with your message.